In 2007, five great stories featuring displaced protagonists captured attention in the children's book world (as measured by the Fire Escape's buzz radar). A National Book Award nominee revealed the strange, lonely place a child inhabits after she leaves the land of her birth. M. Sindy Felin’s Touching Snow tells of Karina, a seventh-grader who moves from Haiti to a suburb in New York with her mother, sisters, and abusive stepfather. 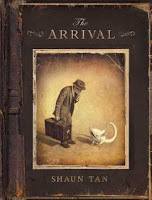 Shaun Tan's wordless graphic novel, The Arrival, an achetypical immigrant's story, poignantly and masterfully depicted a young father escaping an unnamed war-torn country in search of a better life for his family in a new world. A funny, fast read by a member of the Class of 2k7, Rose Kent, featured a likeable male protagonist. Kimchi & Calamari is the story of fourteen-year-old Korean adoptee Joseph Calderaro who sets out on a search for his birth family while enjoying close ties with his Italian-American parents and sisters. Home of the Brave (my favorite readaloud of 2007) by Katherine Applegate is a lyrical novel told in the voice of brave, honest Kek, a refugee from a country in Africa starting a new life without his mother, father, and brother in wintry Minnesota. And last but not least, Does My Head Look Big in This? by Randa Abdel-Fattah traveled from Australia to the US and made a big splash. Amal, a 16-year-old Australian-born Muslim Palestinian, struggles with the hyphenated life as she decides to wear hijab at her prep school. NOTE: Kids living on reservations cross cultural boundaries also, albeit in a different way, so I have to add that The Absolutely True Diary of a Part-Time Indian by Sherman Alexie was perhaps the most touted novel of the year. Alexie introduced us to unforgettable Junior, a Spokane Indian who transfers from the reservation school to a white high school.